Can you believe this is the end of August? We are so busy getting ready for Fall and all the Holidays that August has just flown by. Did I mentionI am probably on a candy corn high? I am pacing myself. There is a bag and plastic tub of them across from me on the table and thank goodness I can't smell them. But not too much craziness today as we have so much to tell you. Are we excited!!!!! Okay, where do I begin? There is so much excitment that we can hardly sleep for the samples we are working on. First, we have some great montlhy programs scheduled to arrive in the Fall. We have already unveiled the Bread and Butter Society for starters. We have Baltimore Christmas kits being cut as I type and it is a beauty. I have a picture for you to peruse and pricing will be available next week. The patterns are $ 78.00 and each month's fabric is in an envelope so working on this piece is done block by block. This is an hand applique pattern but we are doing it fused. This is the same pattern designer that did the fabulous Baltimore Halloween. 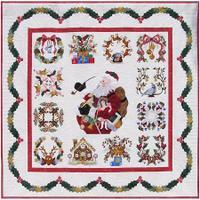 We are also doing the quilt Anita's Christmas which is perfect for that special chld in your life. We have brighten the colors slightly. This will be fused as well. This kit is for your backgrounds and stars only. 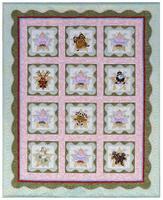 That way you can use "the stash"; or we will assist in filling in the applique fabrics. 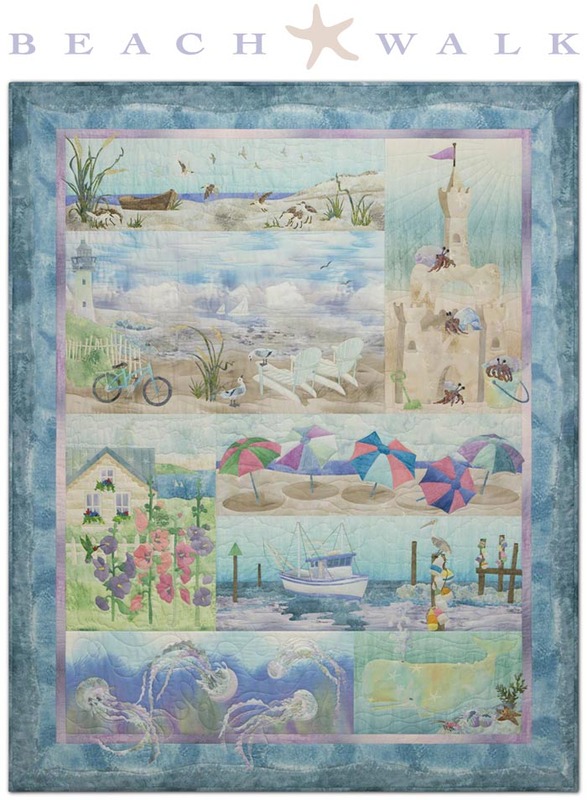 But their are two programs we have been dying to have arrive one is "A Charmed Life" by Robyn Pandolph which features the favorite trips of your life and for those of us who love Paris....the Eiffle Tower is in the Center. 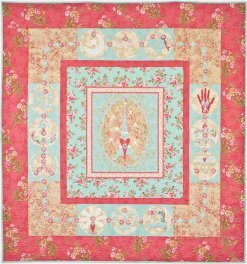 It uses her new fabric line called Rue Saint Germaine. The colors are so rich and it reminds us of the original Robyn Pandolph prints. We think you will agree. The BOMs will be ready with pricing next week as we are still awaiting some of the patterns. However, if you think you might be interested send us an email and we will hold a spot for you. They will have classes but we are trying a new plan of shorter time rather than a year because we and you seem to just get bored at the end. This is just the BOMS that came in. We also received fabric that I will share next week with you. There is some cool new stuff coming in. More pictures and information can be found at this link: www.jampatch.com/news-flashes.htm If you are interested in any of the above samples give us a call or e mail and we will be happy to hold a kit just for you. This is Saturday Sampler Weekend. The class is at 9:30am on Saturday and 1pm on Monday. We are getting closer and closer to the last blocks and they sure are looking good. We will see you on Saturday or Monday to "FLASH." UFO sewing days are Tuesday, Wednesday and Thursday, August 31st, September 1st and 2nd of next week. The Bread and Butter Society starts on Wednesday, September 8th and Saturday, September 11th. Turtle Challenge "Poking at the Patch"
Don't forget that we are having a challenge using the pattern that Margy did of a turtle "Poking at the Patch." You can pick up a copy of the pattern at the store or check out "News Flashes" on our website and get a copy there. All the instructions are at the top of the pattern. Remember your sewing machine needs to be serviced each year. George is here on Mondays and usually gets your machine done that day. A little bit of prevention is better than a broken machine. With all the rain everything is going GREEN around here. Yep, this week we are offering all green fabrics $5/ yard. (excluding any dated 10-...) remember no points awarded or redeemed on sale merchandise and we request 1 yard minimum cut on all sale fabrics. The greens are on sale Saturday, August 28th through Saturday, Sept. 4th. Blue is on until the end of business on Saturday. Reminder: We are closed Monday, Sept 6th to celebrate Labor Day. Hope everyone enjoys the day!